Antique tool collectors and dealers in antiques who might not otherwise have an interest in cast iron implement wrenches begin to change their focus when they learned that the two highest prices ever paid for wrenches were for tools of this type. Long considered incomprehensible by many collectors, P.T. 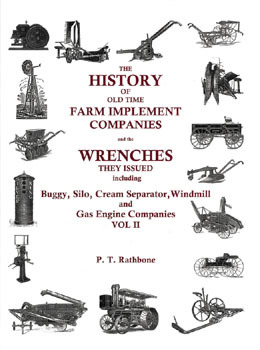 Rathbone has put together a work that makes sense of the vast array of wrenches produced and issued with plows, cultivators, buggies, silos, cream separators, windmills and more. Organized in encyclopedic fashion by manufacturer, Rathbone's documents in "time line" fashion, the history of each maker and includes illustrations of known examples adjacent to each maker's history. Especially helpful to collectors and dealers is the 176 page softbound supplement included with this volume that allows wrenches marked only with numbers to be linked to manufacturers and also includes a summary of recent auction prices. In all likelihood, the cost of this book will be covered by the first wrench in the top of a box of similar items in the garage. A necessary reference that will more than pay its own way.